Invisibility is a property that would clearly have to arise at the atomic level, via Maxwell’s equations, and hence would be exceedingly difficult, if not impossible, to duplicate using ordinary means. To make a solid boy like Harry Potter invisible, you would have to liquefy him by boiling, crystallize him, heat him again, and then cool him, all of which would be quite an accomplishment, even for a wizard. Light traveling from a vacuum (upper left) into a denser transparent medium slows down, and as a consequence changes direction: its path bends, or becomes refracted. The denser the material, the more the light slows down, and thus the greater the degree of bending. So light bends more in a diamond than in water, and hardly bends at all in air. In natural mediums, light never angles backward beyond an imaginary line (dotted line) perpendicular to the surface where it crosses into the medium. To do so, the medium would have to have what is known as a negative index of refraction. That barrier has been broken by exotic man-made materials, called metamaterials, that bend light far more than once thought theoretically possible. Of course, short of changing someone or something’s atomic structure, there are other optical options. At the heart of current invisibility research is the manipulation of something called the “index of refraction.” When you put your hand in water, or look through the lenses of your glasses, you’ll notice that water and glass distort and bend the path of ordinary light—that’s refraction. Light slows down when it enters a dense, transparent medium, but in a pure vacuum the speed of light always remains the same. The index of refraction of any given material is obtained by dividing the speed of light by the slower speed of light inside the medium. 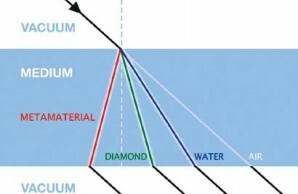 Since the speed of light divided by itself equals 1, a natural material’s index of refraction is always greater than 1. It is also ordinarily a constant: a beam of light bends at a particular angle when it enters a given substance, such as glass, and then keeps going in a straight line [see illustration left]. But what if you could control the index of refraction at will, so that, for instance, it changed continuously from point to point in the glass? If a beam of light could create its own path—slithering around an object’s atoms like a snake—and exit the material along the same line it entered, then the object could be invisible. To do this, however, the object would need to bend light in unorthodox ways, which would require using a medium with a negative index of refraction, and that’s exactly what every optics textbook for decades said was impossible. Yet in 2006, researchers at Duke University’s Pratt School of Engineering in Durham, North Carolina, and at Imperial College London successfully defied conventional wisdom and made objects that were “invisible” to microwave radiation—by manipulating refraction. The metamaterial, made by the Duke University engineers, relied upon tiny implants that forced electromagnetic waves to bend in unorthodox ways. Tiny electric circuits were embedded in a concentric series of bands arranged rather like the coils of an electric oven. Those implants—a mixture of ceramic, Teflon, fiber composites, and metal—made it possible to channel the path of microwave radiation in a specific way around the device. A small copper cylinder inside the device was undetectable to microwave radiation. But it did cast a minuscule shadow. True invisibility requires eliminating all reflections and shadows.